The Appalachian Trail at Springer Mountain and its approach from Amicalola Falls State Park reopen today after a five day closure imposed while the U.S. Forest Service and partners battled a large wildfire in the area. The Black Mountain Fire is now one hundred percent contained within a 455 acre containment area. It began Saturday near the Black Mountain and Springer Mountain area of the Chattahoochee National Forest near the Dawson, Gilmer, Fannin and Lumpkin County lines. A large response team was mobilized which included the local U.S. Forest Service Type 3 Incident Management Team and crews from a neighboring national forest. Georgia Forestry Commission, Georgia Department of Natural Resources, U.S. Fish and Wildlife Service, Lumpkin County Fire Department and Gilmer County Fire Department all assisted in the response. The wildfire did not affect any structures, including the Black Mountain trail shelter, and was not a threat to Amicalola Falls State Park or the Len Foote Hike Inn. All temporary closures have been lifted for the Appalachian Trail approach trail from its crossing on Forest Road 28-2 at Nimblewill Gap to the Springer Mountain trailhead parking area on Forest Road 42. In addition, Forest Road 46 between Nimblewill Gap and High Shoals Church Road is now open. At noon on November 15th, friends, family, and coworkers of maintenance worker Dana Bruce gathered in the courtyard of headquarters of the Blue Ridge Parkway to dedicate a memorial to him. Dana, a third year seasonal employee, died while mowing Haw Creek Valley Overlook on May 7th. During comments made by Shawn Benge, deputy regional director for Southeast Region, the attendees were reminded that every NPS employee is impacted by Dana’s death. The memorial was designed by Blue Ridge employees, created at the Carolina Bronze Foundry, and constructed by Brandon Hensley. It rests near a memorial honoring Joe Kolodski, a ranger who died in the line of duty in 1998. Great Smoky Mountains National Park announces the 37th annual Festival of Christmas Past celebration scheduled Saturday, December 8th, 9:30 am to 4:00 pm, at the Sugarlands Visitor Center. The event, sponsored in cooperation with Great Smoky Mountains Association, is free to the public. Festival of Christmas Past is an annual celebration of the culture of the Smoky Mountains, with an emphasis on the Christmas season. "Around Christmas time, people gathered in churches, homes, and schools and many of them celebrated the holiday through music, storytelling, and crafts. Festival of Christmas Past allows us to pause and remember some of these traditions," said Kent Cave, North District Resource Education Supervisor. The festival will include old-time mountain music and traditional harp singing. Demonstrations of traditional domestic skills such as the making of rag rugs, apple-head dolls, quilts, and apple butter will be ongoing throughout the day. There will also be several chances to experience these traditions hands-on, with crafts to make and take home. The Christmas Memories Walk will be held at 11:00 am and 2:00 pm to teach visitors about the spirit of the season in these mountains in the time period from the 1880s to 1930s. "The Memories Walk always gets everyone in the Christmas spirit," said Cave. "Our wonderful volunteers portray some colorful characters that you might have found in a mountain community. We have a great time developing these skits each year." • 11:00 am -12:30 pm and 2:00 pm to 3:30 pm - "Christmas Memories Walk" - Costumed interpreters will lead a short walk from the visitor center and talk about life in the mountains during the holidays in the early days of the 1880s to the 1930s. "Local craftspeople and musicians come together to share their ancestral skills with the public during this annual festival. We invite the public to participate in the day's activities and learn about winter life and work in the Great Smoky Mountains," said Cave. Managers at Great Smoky Mountains National Park announced plans to implement a complete closure of the 11-mile Cades Cove Loop Road to all vehicular traffic on Monday, December 3, and to impose a partial closure on Tuesday, December 4. During that time, Park forestry technicians will treat hemlock woolly adelgid (HWA)-infested hemlock trees with a horticultural oil sprayed from large truck-mounted units as they have been doing since 2004. In the event of heavy rain or freezing weather, the operation will be rescheduled. To check the status of the road closure, visitors can call the Park's general information number at 865/436-1200 or follow our roads status on Twitter at www.twitter.com/smokiesroadnps. During the full closure on December 3, only hikers will be allowed to travel the Loop Road. Bicyclists will not be allowed to enter the Loop Road for safety reasons since there will be heavy equipment on the road making it unsafe for bicycling. Park personnel will be working at the entrance and exit areas of the Loop. The spraying operation on December 4 will only impact the western end of the Loop Road. Motorists and cyclists will be able to enter the Loop as they normally would, but will have to detour across the Loop via Hyatt Lane (the second gravel crossroad) to exit Cades Cove. Hikers can continue through the closed portion. The detour will shorten the length of the trip to an 8-mile tour of Cades Cove. The Hyatt Lane bypass will eliminate access to the Cades Cove Visitor Center and Cable Mill area as well as the several trailheads located on the western end of Cades Cove: Abrams Falls, Cooper Road, Rabbit Creek, and Wet Bottom Trails, and Gregory Ridge trailhead. As part of the Park's control efforts of the hemlock woolly adelgid, actions include spraying hemlock trees with the oil/soap application in high-use developed areas that are easily accessible by vehicles such as Cades Cove, campgrounds, picnic areas and along roadsides. Jesse Webster, Hemlock Woolly Adelgid Project Coordinator, said that, "In addition to spraying trees in developed areas, the Park is utilizing a systemic pesticide to treat some of the larger hemlocks in the spray zone. The systemic treatments move into the tree canopy with sap flow and can effectively control adelgids for 5-7 years which can be a more practical and cost effective approach to management. The spray acts as a quick knockdown allowing the systemics to catch up." The park employs a three-prong approach that also includes the release of predator beetles. All of the chemical and biological control techniques are showing positive effects in areas of these treatments, despite the noticeable decline of tree vigor and mortality throughout the Park. Currently about 600 acres are being sprayed annually, over 220,000 hemlock trees have been hand-treated with systemic pesticides spread across 8,000 acres, and about a half-million predator beetles have been released. Next spring the Great Smoky Mountains Association will be releasing a documentary based on Clingmans Dome, and the Spruce Fir Forests that cling to the spine of the highest mountains in the Southern Appalachians. These unique rare ecosystems are very vulnerable, and are relics from the last ice age. This documentary will be the first in the new Smoky Mountain Explorer series, which will encompass and document a large portion of the parks unique habitats, wildlife, and flora. The Smoky Mountain Explorer series will be approximately 8 segments of 40 minutes apiece, with Clingmans Dome kicking off the series. The film will be available at GSMA stores in blu-ray format, and through digital downloads through iTunes. One of Zion National Park’s most famous features is the death-defying hike up to Angels Landing. The trail climbs 1200 feet in roughly 2.4 miles. The last half-mile features sharp drop-offs along a very narrow path, and includes chains for hikers to hold onto. The chains are there for a very good reason. In the past eight years alone, six people have plunged to their deaths after losing their footing along this trail. 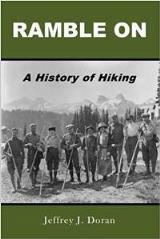 Below is an excellent video that shows what hiking this trail is all about. Back in September my wife and I visited Zion. Although this trail is one of the most popular hikes in the park, we opted not to take it. Instead, we hiked up to Observation Point, which is a bit safer, and arguably offers better views, including a birds-eye view of Angels Landing. If you've never been to the park, I highly recommend it. The question is, would you hike to Angels Landing? With a baby? The U.S. Forest Service and partners are responding to a wildfire burning approximately 215 acres near the Black Mountain and Springer Mountain area of the Chattahoochee National Forest near the Dawson, Gilmer, Fannin and Lumpkin County lines. A large response team has been mobilized, including the local U.S. Forest Service Type 3 Incident Management Team and crews from a neighboring national forest. Partners including Georgia Forestry Commission, Lumpkin County Fire Department and Georgia Department of Natural Resources are assisting in the response. The fire was first reported on November 24 around 7:00 p.m. The cause of the fire is under investigation. Officials have not identified any structures being threatened at this time. The wildfire is not threatening Amicalola Falls State Park or Len Foote Hike Inn. Officials are advising the public to avoid the area. A temporary closure has been issued for the Appalachian Trail approach trail from its crossing on forest road 28-2 at Nimblewill Gap to the Springer Mountain trailhead parking area on forest road 42, including the Black Mountain trail shelter. Forest road 46 is also temporarily closed between Nimblewill Gap and High Shoals Church Road. You can view vicinity and local area maps showing the location of the Black Mountain Fire by clicking here. Thanks again for all you support - we really appreciate it! National Geographic now has two separate Trails Illustrated Maps for the Great Smoky Mountains - in addition to the old map. National Geographic has divided the Park in two sections, thus allowing each map to show much greater detail. The original map, which covered the entire Park, had a scale 1:70,000. The two new maps now have a scale of 1:40,000 (1” = .6 miles) and provide much greater detail such as backcountry campsites, footbridges, fords and stream crossings, nature/interpretive trails, as well as detailed trail mileages. The map for the eastern section includes Clingmans Dome, Mt. LeConte, Newfound Gap Road, Big Creek, Oconaluftee and the Cataloochee areas. The Appalachian Trail Conservancy (ATC), along with the Georgia Appalachian Trail Club (GATC) and the city of Helen, invites the public to attend the official designation of White County/Helen, Georgia as the newest Appalachian Trail Community™ on November 30, 2012 at 11:00 a.m. The ceremony will be held at the Bandshell Amphitheater located 100 feet north of the Chattahoochee River near Hwy 17/75 in downtown Helen, Georgia. This event is free and open to the public. Over 40% of White County is comprised of state and federal public lands, making outdoor recreation a dominant feature of this mountain community. The city is most known for its Bavarian flavor, giving tourists a taste of the southern Appalachians. The designation ceremony will begin with the national anthem performed by Charles Aiken, thru-hiker and longtime GATC volunteer and Trail-maintainer. Aiken was first introduced to the Appalachian Trail (A.T.) at age 12 and has continued to share his passion for the Trail ever since. He recently developed a hiking program, now active in various North Georgia schools, where students can learn about the history of the A.T. and experience the outdoors. Following the national anthem, various guests will present including Mark Wenger, executive director/CEO of the ATC, Morgan Sommerville, southern regional director of the ATC, Mayor Judy Holloway and Tom Aderhold, former president of GATC and longtime volunteer awarded the 50 Year Service Award by the National Park Service for his efforts managing the A.T. The Appalachian Trail Community™ is a new program of the ATC, the nonprofit responsible for management and protection of the A.T. Launched in 2010, this program recognizes and thanks communities for their part in promoting the A.T. as an important local and national asset. Park Resource Managers recently confirmed the Smokies first backcountry emerald ash borer (EAB) infestation. 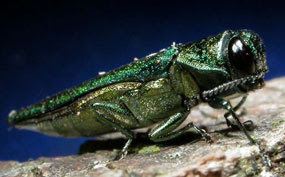 According to Great Smoky Mountains National Park Biologist, Glenn Taylor, "The emerald ash borer is a 1/2 inch-long metallic green beetle that lays eggs on the bark on all species of ash trees. After hatching, the EAB larvae burrow under the bark, and create feeding tunnels that cut off nutrient and water flow to the tree. The tree can die in three to five years." Accidentally introduced to North America from Asia, EAB was first discovered in southeast Michigan in 2002, and has spread to 16 states and two Canadian provinces killing tens of millions of ash trees. Since 2009, officials have been monitoring for the presence of EAB. Front country infestations were confirmed in June 2012 at Sugarlands Visitor Center and at the Greenbrier entrance to the Park. An off-duty park employee discovered the backcountry infestation on an administrative trail in the Greenbrier area on November 8, 2012. The employee noticed a pile of bark chips at the base of several ash trees. Signs of woodpecker activity on ash trees is an excellent indicator of an EAB infestation. Paul Merten, a forest insect specialist from the USDA Forest Service in Asheville, NC, confirmed EAB at the site by looking under ash tree bark for feeding tunnels left by the immature beetle. "The infestation is well established, probably two years old or older," Merten said. Complete eradication of EAB is not currently feasible, but Park Resource Managers are developing a management plan to maintain public safety and protect ash trees where possible. EAB and other tree pests can be transported in firewood. Park regulations prohibit bringing firewood to the Smokies from areas that have been quarantined for EAB or other destructive pests. For more information about firewood regulations at the Smokies, visit the park website. Kristin Bail, forest supervisor of the USDA Forest Service National Forests in North Carolina, has announced that the agency is beginning the formal process of revising the Nantahala and Pisgah National Forests Land and Resource Management Plan (the Plan). The Plan will guide management of the Nantahala and Pisgah National Forests for approximately 15 years. The Nantahala and Pisgah National Forests are two of four national forests in North Carolina that are managed by the Forest Service. The Nantahala and Pisgah National Forests are found in western North Carolina and encompass more than 1 million acres. Together, they are among the most visited national forests in the nation. The Plan revision process will occur over a three-to-four year period. It begins with the Assessment Phase, which will take about a year to complete. During this phase, the Forest Service will collect and compile data and other information on the current state of the Nantahala and Pisgah National Forests. The Planning Phase, which follows the Assessment Phase, will take two to three years to complete. After the Plan is completed, the Monitoring Phase will begin and continue until the next Plan revision. In the coming months, the Forest Service will provide details on meetings and other information that foster public participation in the Plan revision process. Information about the Plan revision process is available online at: www.fs.usda.gov/goto/nfsnc/nprevision. To receive email updates on the Plan revision, visit www.fs.usda.gov/nfsnc and click on “To receive News and Alerts by Email, ” then select Nantahala or Pisgah National Forest. Originally published in 1987, the Plan received a significant amendment in 1994. Each national forest and grassland is governed by a management plan in accordance with the National Forest Management Act. These plans set management, protection and use goals and guidelines. The 2012 Planning Rule guides the planning process. The rule includes stronger protections for forests, water and wildlife, while supporting the economic vitality of rural communities. It requires the use of the best available scientific information to inform decisions. The 2012 rule strengthens the role of public involvement and dialogue throughout the planning process. Last week we announced the launch of our brand new hiking website for Rocky Mountain National Park. Today I wanted to offer you my top 10 hikes in case you're considering a visit to this beautiful national park in Colorado. If you're unfamiliar with the park, I think you'll find this list to be a helpful guide as you make your plans. Chasm Lake - Hands down this is the best lake hike in Rocky Mountain National Park. In addition to outstanding panoramic views on the way up, you’ll have a front row view of the famous “Diamond”, the east-facing wall of Longs Peak which rises more than 2,400 feet above this incredibly beautiful alpine lake. Emerald Lake - The hike to Emerald Lake takes you deep into the Tyndall Gorge, and visits three other beautiful subalpine lakes along the way. Although Bear Lake and Dream Lake are nice stops, Emerald Lake is the true gem in this chain of lakes fed by the Tyndall Glacier. Ute Trail - Want great panoramic views without having to climb a lot of altitude? The Ute Trail is the perfect choice. This relatively flat hike along Tombstone Ridge offers hikers the chance to explore the alpine tundra zone, while soaking in the outstanding views of Forest Canyon, Longs Peak, Moraine Park and Estes Park. Sky Pond - Surrounded on three sides by sheer cliff walls, Sky Pond offers hikers a dramatic scene. What makes this hike a RMNP classic is that you’ll visit two waterfalls and two other stunning lakes along the way. However, the scramble next to Timberline Falls to reach the basin may present a challenge for people with a fear of heights. 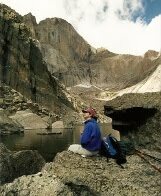 Bear Lake to Fern Lake TH - As a result of Rocky Mountain National Park’s excellent shuttle system, hikers have the option of taking the spectacular one-way hike from Bear Lake to the Fern Lake Trailhead in Moraine Park. Along the way you’ll visit four magnificent lakes, a 60-foot waterfall, plus you’ll make the spectacular descent into the Odessa Gorge. Lake Helene - Although Lake Helene is denoted on the official park map, the side trail leading to its shore isn’t marked with a trail sign. Don’t let this deter you - this is one of the most scenic lakes in the park. Bluebird Lake - This is another hike that offers several attractions along the way, including three waterfalls. 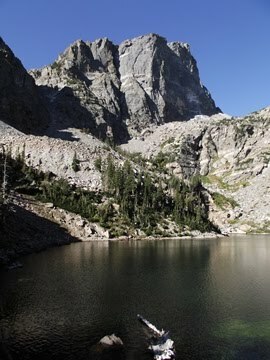 Bluebird Lake, which fills a deep cirque beneath Ouzel Peak along the Continental Divide, is the star attraction. The Keyhole on Longs Peak - This hike should probably rank higher, but I had to take it down a few notches due to its level of difficulty. In terms of distance and elevation gain, this is a very difficult hike. The terrain - crossing the Boulder Field and then making the scramble up to the Keyhole - makes this an extremely difficult hike, and is likely the most difficult hike I’ve ever been on. However, the payoff is quite large. The views along the way, as well as from the Keyhole itself, are simply amazing. Lake Haiyaha - Lying in the heart of Chaos Canyon, Lake Haiyaha offers a stunning vista of the surrounding area. 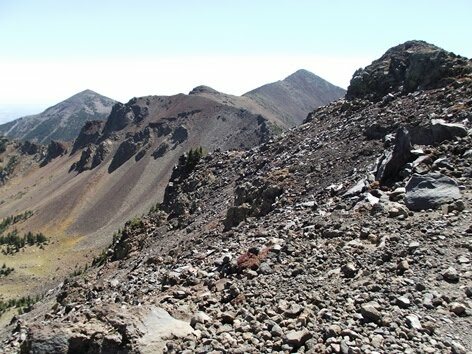 From its rugged shore hikers will have outstanding views of Otis Peak and Hallett Peak. You should also consider the Mount Ida Trail. If you think most of these hikes are too long, or maybe too strenuous, check out my list of the Best Easy Hikes in Rocky Mountain National Park. Are Threats of Budget Cuts Closing National Parks Overblown? “With looming closures throughout the national park system if scheduled cuts occur in January through the budgetary sequester, we are encouraged to hear President Obama and congressional leaders focusing on the necessity of a balanced approach to addressing the federal deficit. In fact, the first leg of that stool was the Budget Control Act, which already cut significant funds for national parks and other worthwhile programs. It is time for our leaders to bring more balance to the equation. “If Congress fails to find a solution by January, more than $200 million dollars could be cut from the National Park Service budget, which would likely close visitor centers and campgrounds, and could put as many as 9,000 rangers and other park employees out of a job. 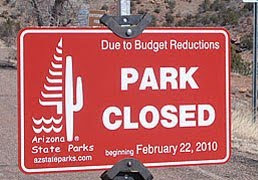 These cuts could close as many as 200 park sites across the country. “According to a recent poll, 92 percent of Americans believe funding for national parks should either remain steady or be increased. Sequester or not, our national parks will face a tough decade ahead. They cannot afford additional cuts after two consecutive years of cuts and a budget in today’s dollars that is 15 percent less than it was a decade ago. I'm going to have to take the contrarian view here, and say that these fears are simply overblown. Whenever the idea is floated that parks could be closed due to budget cuts, it conjures up images of the Great Smoky Mountains or Glacier National Park being shut down. In reality, those headlines are referring to national park units that most people have never heard of, such as Alibates Flint Quarries National Monument in Texas, or River Raisin National Battlefield Park in Michigan. The cynical side of me thinks that these assertions are meant to scare people into coughing up more of their tax dollars. Right now there are 398 national park units, which include national parks, monuments, battlefields, lakeshores, seashores, historic sites, etc. Based on the current budget shortfalls within the National Park Service - even before the proposed cuts - it's pretty obvious that the NPS has over-extended itself. From my perch it's clear that the NPS has taken on responsibilities for far too many properties beyond the scope of their charter. Wouldn't it be better if the federal government sold parks such as Devils Postpile National Monument, or Bent's Old Fort National Historic Site, back to the states to be managed under state park systems? Or, what if some parks, such as Weir Farm National Historic Site, or Carl Sandburg Home National Historic Site, were sold to private entities - with certain stipulations - and run as for-profit organizations, or maybe even as a non-profit foundation, similar to Thomas Jefferson's Monticello? In my view, this would allow the NPS to concentrate its limited resources on running the parks and monuments that deserve national recognition and preservation, more efficiently. An overnight rainstorm on November 14th brought down several trees and boulders onto the trail, blocking access and damaging a footbridge. The popular trail leads to the bottom of the 404-foot-high waterfall. Damage assessments continue, but the trail could be closed for several weeks. The park’s lower, winter admission rates of $10 for adults and $6 for youth will go into effect immediately. 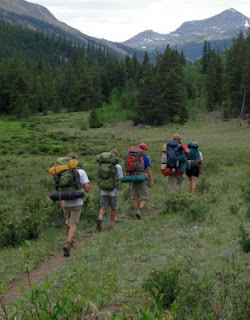 The folks at Wilderness Wildlife Week have announced the hiking schedule for the upcoming annual event, which will take place during the week of January 12-19, 2013. Considered to be the ultimate Smoky Mountain experience, Wilderness Wildlife Week is a series of activities designed to connect visitors with the great outdoors. Participants will learn from more than 100 experts who will share their knowledge of the outdoors in more than 175 seminars, lectures and hands-on workshops. You'll also have the opportunity to get closer to nature with your choice of more than 50 guided walks and hikes this year. Some of the highlights on this years' schedule include Mt. 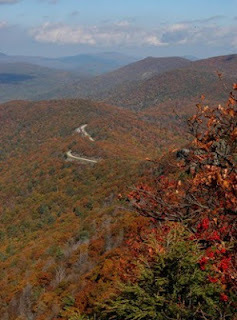 Cammerer, Abrams Falls, Albright Grove, the Original Road to the Walker Sisters homestead, Rainbow Falls, as well as a couple of off-trail hikes to Greenbrier, Meigs Mountain and Round Top. You can check out the full hiking schedule by clicking here. Hikers may also want to note the relatively stringent sign-up procedures. For more information on the entire event, please click here. Tennessee Department of Environment and Conservation Commissioner Bob Martineau and Deputy Commissioner Brock Hill announced this week that Virgin Falls State Natural Area in White County has been acquired by the state of Tennessee through the support of a number of private/public partnerships. Virgin Falls has been under private ownership, but managed by the state as a natural area for nearly 40 years. Working closely with the Tennessee Parks and Greenways Foundation, the state of Tennessee was able to purchase the 1,551-acre parcel near Sparta through a combination of funds from the U.S. Fish and Wildlife Service, Tennessee Wildlife Resources Agency and private donations. A favorite hiking destination for decades, Virgin Falls features a waterfall that exits a cave at the top of a cliff and then disappears into a second cave at its base. Nature lovers have noted the existence of unique flora and fauna and amateur geologists have explored the composition and structure of its many caves. The federal funding comes from an Endangered Species Recovery Land Acquisition Fund grant due to the occurrence of four threatened and endangered species on the property. The recovery and conservation of these species will be part of the land management plan. While portions of the property have been a state natural area for nearly four decades, this acquisition will permanently prevent degradation and fragmentation of the habitat for these species, as well as provide opportunities for habitat restoration. The Virgin Falls property is located adjacent to the state-owned Bridgestone Firestone Centennial Wilderness Wildlife Management Area, which conserves rugged Scott’s Gulf along the Caney Fork River. This gorge stretches for approximately 18 miles as the Caney Fork River drops from the top of the Cumberland Plateau eventually draining into the Cumberland River. A major portion of the property will be managed as a component of Tennessee State Parks and the State Natural Areas program. The remainder will be owned and managed by TWRA. The close proximity of the parcel is adjacent to TWRA-managed properties, providing unimpaired game and species movement along a preserved corridor. For more information about Tennessee State Parks, please visit www.tnstateparks.com. Information about Tennessee’s State Natural Areas program can be found at www.tn.gov/environment/na. Friends of Great Smoky Mountains National Park announced yesterday that they are the recipient of a $12,000 grant from the Verizon Foundation to empower teachers with science and technology. The program, based in Great Smoky Mountains National Park, delivers an array of education enrichment opportunities to teachers from East Tennessee and Western North Carolina who will use their knowledge to benefit local students as well. “The Verizon Foundation’s generous support completely covers the funding request we received from the Park for this program for 2013,” explained Friends of the Smokies’ President Jim Hart. Next spring and summer, the grant will fund two teacher workshops focusing on the latest teaching methods, lesson plans adapted to curriculum changes and new science content, and current technology. Through Verizon’s support, 60 teachers will participate in the workshops at no cost. The grant also provides bus transportation to enable these teachers to return to the national park with their students through the Parks as Classrooms program. Additionally, two educators will have the unique opportunity to conduct hands-on scientific studies in Great Smoky Mountains National Park working alongside park staff, and to assist with summertime ranger education programs. This initiative is called Teacher-Ranger-Teacher because participants pick up information and new ideas while performing ranger duties in the national park which they take back to their classrooms and to other teachers. For more information about the educational programs offered in Great Smoky Mountains National Park, visit http://www.nps.gov/grsm/index.htm. The Blue Ridge Parkway has announced that it has implemented a full, two-lane closure to all visitor use between Milepost 355.3 and Milepost 359.8. The closure begins just south of Highway 128, at the entrance to Mount Mitchell State Park, and ends at Walker Knob Overlook. Access to Mount Mitchell State Park remains open to southbound Parkway traffic via State Road 80. Parkway thru traffic is detoured from Asheville along Highway 70 to I-40 to Highway 226 to Highway 221 and back to Highway 226 to the Parkway. Buses and recreational vehicles are encouraged to take Highway 221 to the Parkway. The closure and detour will remain in effect until spring of 2013 to ensure public safety while critical slope stabilization repairs are completed on the Parkway. Parkway management apologizes for any inconvenience to our visitors. Many children and their parents are looking for ways to increase academic performance to prepare for college admission and a future career. This pursuit often ends in seeking “smart drugs” such as Ritalin or Adderall to improve concentration. Even adults without symptoms of ADHD are now taking these drugs to work longer hours. The current trend is to medicate children, not considering that changing the environment where they spend their time could have more positive health consequences. Children are often in places full of artificial stimulants including video games, television, music, smart phones and other devices that grab attention. Replacing this with time in nature can have positive health outcomes. The Natural Learning Initiative led by Dr. Robin Moore, a professor in the landscape architecture program at North Carolina State University, is helping to educate about the positive health benefits of children spending time in nature. The purpose of this initiative is to promote the importance of the natural environment in the daily experience of children, through environmental design, action research, education, and dissemination of information. One of the intriguing developments of this movement is the creation of natural play areas that encourage the use of creativity and imagination, as well as longer and richer play experiences in a natural setting. Reedy Creek Nature Preserve in Charlotte, NC recently added one of these play zones. Research is now revealing that time in nature reduces symptoms of ADHD in children. The Landscape and Human Health Laboratory (LHHL) at the University of Illinois is a multidisciplinary research laboratory dedicated to studying the connection between greenery and human health. Recent research at LHHL has found that nature has a calming and restorative effect on children and adolescents with ADHD, reducing symptoms and having a positive effect in cases where other treatments offer only limited help. The lab continues to research in this area and is currently examining the effects of schoolyard nature on children’s learning and academic achievement as reflected in standardized test scores. Innovative programs are needed to get children and families in nature. An example of this is the Kids in Parks Program developed by the Blue Ridge Parkway Foundation, which is helping to get families out on nature trails. The mission of this program is to promote children’s health and the health of parks by engaging families in outdoor adventures that increase physical activity and foster a meaningful connection to the natural and cultural world. Another program, sponsored by The Children and Nature Network, is the “Lets G.O. !” (Get outside) initiative in April 2013 designed to get people out into nature. All of this aligns with the Child’s Right to Nature and a Healthy Environment Initiative which states that every child has a right to connect to nature in a meaningful way; that every child has the right to be prepared and equipped to help address environmental challenges; and a right to a clean and healthy environment. We have a responsibility to preserve natural areas so that the next generation can experience the beauty and health benefits that are associated with it. This is especially important for children who grow up in inner city environments, with no access to nature. How can you help to get children out in nature more? Dr. Mark Ellison is an educator, researcher and author on using the restorative power of nature for optimal health and effectiveness. While earning a doctorate in adult education and human resource development from North Carolina State University, Dr. Ellison's dissertation explored the restorative benefits of hiking in wilderness solitude and the relationship to job satisfaction. He's recently started a second research study focused on hiking and the relationship to psychological well-being and reduced stress. He is also the founder of HikingResearch.com. In addition to being a great source for trail information, we designed the site to be an excellent tool for vacation planning as well. We’ve included a lot of RMNP travel information that will be helpful while planning a vacation. Even if you have no plans on traveling to RMNP, I hope that maybe you’ll enjoy some of the photographs on the site. If you know of anyone planning a trip to Rocky Mountain National Park, or any hikers in general that might be interested, please feel free to forward the website onto them. The new website is organized in several directories to help hikers find the trails they want to hike. We have an alphabetic listing, trails listed by difficulty rating, by trail feature, and by location within the park. 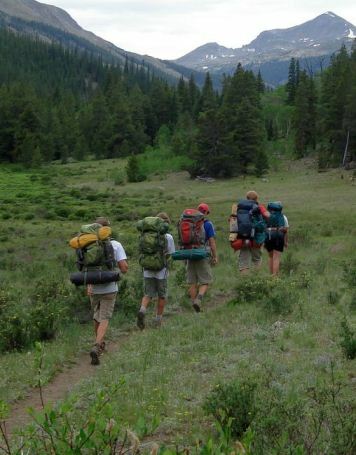 We also provide a directory of classic Colorado hikes outside of the park. The National Park Service is soliciting public comment on an Environmental Assessment/Assessment of Effect for a Rock Outcrop Management Plan that incorporates hiking, camping and climbing. This Environmental Assessment/Assessment of Effect is being reissued since it was made available for public review in 2008. The document analyzes alternatives that direct the future management of rock outcrop areas and manages climbing in Shenandoah National Park. The Park's rock outcrops are some of the largest in the region and contain a myriad of important vegetation communities and rare plant and animal populations. These rock outcrops are popular destinations in the Park and draw visitors to the views, sweeping vistas and climbing activities they afford. Some of the proposals in the document include the relocation of the Appalachian Trail on Little Stony Man Mountain, as well as barring access to the main and western summit of Old Rag. It would also close Hawksbill and North Marshall Mountain to camping, prohibit rock and ice climbing on Hawksbill, and permanently close the Bettys Rock Trail. Intense use of these areas by climbing, hiking, and camping enthusiasts has led to loss of vegetation and soils at some cliff sites, including impacts to rare species and communities. This management plan would provide the direction to guide management decisions, protect geologic and biological composition, and minimize visitor use impacts. Given that Park management personnel are mandated to protect rock outcrops while still providing opportunities for visitor enjoyment of these resources, this plan would mitigate impacts of visitor recreation activities, accommodate visitor use, and direct the future management of rock outcrops. The public is invited to comment on the reissued plan. The document will be available for public review for 30 days. During this time, the National Park Service will accept written and oral comments regarding the project through December 13th (it will probably take most people that long to get through the bloated 207-page document). For more information, please click here. Below is an absolutely stunning timelapse video from the Pacific Crest Trail by Brad Goldpaint. Brad's videos have been featured on NASA, National Geographic Magazine, Popular Science and MSNBC, among other media outlets. "Within Two Worlds depicts an alternate perspective by giving us the illusion of times movement, signifying a beginning and end within a world of constant contradiction. It appears you are traveling in the midst of a dream, half-sleeping, half-waking, and touching the arch connecting heaven and earth." By the way, later this week, I'll be making a big announcement that hikers and national park lovers should be interested in. Stay tuned! The Friends of the Smokies Classic Hikes of the Smokies series continues next month with a hike along the Mingus Creek Trail. Add a little outdoor-joy to the holiday season with a guided hike of the Mingus Creek Trail, followed by a trip to the Oconaluftee Visitor Center for the Holiday Homecoming event and some holiday shopping. To register call Keith Hoffman at (828) 452-0720. A donation of $35 to go to the Friends’ Smokies Trails Forever program is requested, and includes a complimentary membership to Friends of the Smokies. A donation of $10 is requested from current Friends of the Smokies members. Members who bring a friend hike for free. If selected, you will will win two prizes. First, you will get to test some hot new products in 2013. Second, you will become an elite member of the Backpacker Reader Reader (BRR) team and will be sent on assignment to Outdoor Retailer Winter Market, 2013, in Salt Lake City to write, blog, photograph, and maybe even star in a video or two at the world’s largest outdoor industry trade show. Your job will be to give Backpacker readers a “man or woman in the aisles and behind the scenes perspective on upcoming new gear and new trends. 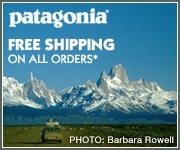 To apply, send a writing sample and a compelling video to Backpacker by December 1, 2012. For more information, please click here. NPS Digest is reporting this morning that in September of 2011, park rangers discovered an area just below the Blue Ridge Parkway, near the Mt. Mitchell area, where recent digging into an old gem mine was apparent. The area was monitored as digging continued. On October 13th and 14th (presumably of this year), two men were found in the site and were arrested for digging and removing kyanite from the pits. Both said that they had visited and dug at the site before, as well as sites on adjacent Forest Service property. A joint investigation is underway with the USFS to identify other individuals who are mining the sites. 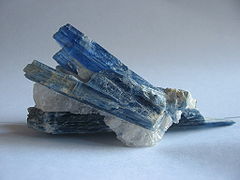 Kyanite is a typically blue silicate mineral, commonly found in aluminium-rich sedimentary rock. It's used primarily in refractory and ceramic products, including porcelain plumbing fixtures and dishware. It's also used in electronics, electrical insulators and abrasives. The U.S. Forest Service today asked visitors and residents near the Pisgah, Nantahala, Uwharrie and Croatan National Forests to help prevent wildfires this fall. In the past week, debris burning and unattended campfires ignited several small wildfires that were quickly extinguished in the mountains and piedmont of North Carolina. With dry forest conditions persisting in parts of the state, Forest Service officials are asking the public to be extra careful when starting campfires in or burning debris near national forests. * Stay with your fire until it is completely out. * Always consider alternatives to burning debris. * Check the weather - don't burn on dry, windy days. * Know your local burning laws. * Be prepared with water, a shovel and phone. Fire Management personnel at Great Smoky Mountains National Park plan to conduct a series of prescribed burns of fields in Cades Cove Monday through Friday, November 5th through 9th if weather conditions permit. Park managers plan to burn several tracts totaling about 570 acres. The selected fields are being burned as part of a cost-effective strategy to prevent the open fields from being reclaimed by forest. The Park contracts to mow about 950 acres of fields that are clearly visible from the Cades Cove Loop Road twice a year. Other fields that are less visible from the Loop Road, totaling around 1,500 acres, are kept open by burning or mowing on a three year rotation. The seasonal prescribed burns encourage the growth of native warm-season grasses providing high quality cover and foraging opportunities for a diversity of wildlife including deer, turkeys, and ground nesting birds. Without being either mowed or burned, the open meadows of the Cove would very quickly revert to pine and hardwood forest. That process would both alter the historically open landscape that characterized the Cove during its period of settlement and deprive Park visitors of the excellent wildlife viewing opportunities often found in the Cove. The burn will be conducted by park Fire and Resource Management staff. Firefighters and fire engines will be assigned each day to ignite the grass lands and to make sure the fire stays within its designated boundaries. Strips of grass surrounding each field slated for burning have been mowed short to provide containment lines. Cades Cove Loop Road will remain open but visitors may experience brief delays due to smoke or other safety concerns as fire fighters work adjacent to roadways. "Motorists are asked to reduce speed in work zones and if smoke is present, keep windows up and headlights on," said Fire Management Officer Dave Loveland. "The public, of course, will notice smoke in the valley but it will dissipate quickly and not unduly impact their visit," he said. Smokies officials are also planning a prescribed burn near Wears Valley for sometime between November 11th and 24th. The International Mountain Biking Association (IMBA) recently announced at their annual World Summit in Santa Fe, New Mexico, that five trails in the Big South Fork National River and Recreation Area were named as Epic Rides. The five trails are Collier Ridge, West Bandy, Duncan Hollow, Grand Gap Loop, and the portion of the John Muir Trail from Grand Gap Loop to Station Camp. "The IMBA Epic designation, being very selective, brings with it national and international recognition to trails that are special to mountain bikers including landscape, trail length, and a back country experience. The Epic designation will draw hundreds of new users, many of who use the IMBA designation as a bucket list of must-ride trails," said Joe Cross, President of the Big South Fork Mountain Bike Club. Big South Fork is the first national park unit in the United States to receive the elite Epic Ride designation. IMBA only names a handful of trails for this title. Other Epic Rides named this year include the Warner Lake area in South Chilcotin, British Columbia, Canada, and the Bernina Express, Graubünden, Switzerland. "This is wonderful news for the Big South Fork," said Niki Stephanie Nicholas, Park Superintendent. "We have a strong partnership with the Big South Fork Mountain Bike Club who have volunteered many hours and worked closely with park staff to improve park trails." For more information on mountain biking in the Big South Fork, please call (423) 286-7275 or go to the park's webpage. The peak is situated next to Arizona Snowbowl, an alpine ski area….in Arizona! The trailhead is located near the upper lodge, and the path crosses over one of the ski runs before entering the Coconino National Forest. Due to construction in the upper parking area, we had to start our hike from the lower parking lot, which added roughly 0.75 miles to our overall mileage. The construction project, which we learned later, was part of a highly controversial plan for Arizona Snowbowl to use treated wastewater on its slopes when blowing artificial snow. At the heart of the issue is finding precious water resources to use for recreational purposes in the middle of the desert. To solve the problem Arizona Snowbowl will become the first ski resort in the world to use 100% treated wastewater to make artificial snow this winter. Both environmentalists and Native Americans are at odds with this decision. The weather on the morning of our hike gave a small hint to the approaching ski season. We noticed a little bit of frost on the ground and in the trees around the trailhead. The first 3.5 miles of the hike travels along a very rocky and rugged path through a thick forest of aspens and pines. The trail climbs steadily on a moderate to moderately strenuous grade throughout the early portions of the hike. 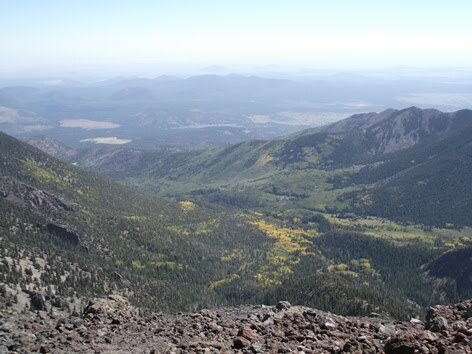 At 11,400 feet, a point marked by a national forest sign, the trees begin to thin out and you’ll begin to enjoy some views of the ski area and the western suburbs of Flagstaff. Beyond this point the trail becomes noticeably steeper as it begins climbing a series of short switchbacks. 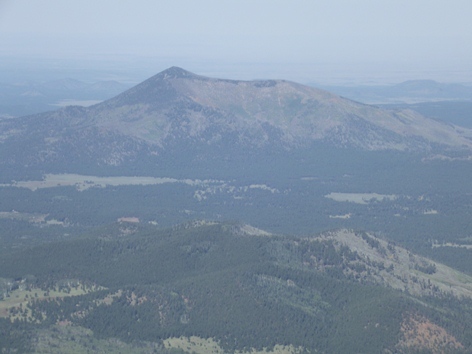 At 3.9 miles we finally crested the saddle between Humphreys Peak and Agassiz Peak, and had our first grand panoramic views of the area. At this point we were finally above of the treeline, and had entered the tundra zone, which is kind of strange saying that when you're in Arizona. 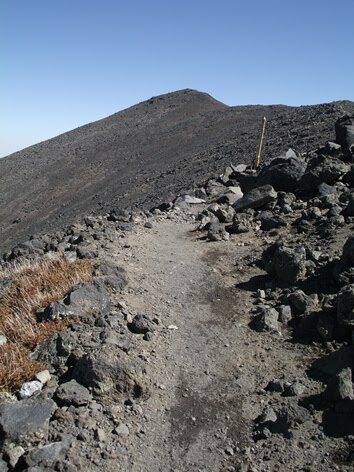 Once on the saddle the trail travels over a barren and rocky terrain, which is actually volcanic rock. Some sections of the trail are somewhat faint and difficult to read, but the route is marked with wooden guideposts. For the most part this is a fairly safe hike. I wouldn’t say there isn’t any exposure to steep drop-offs, but it is pretty negligible. As you proceed to the top there are three false summits you’ll have to contend with along the way. It’s highly recommended that you bring a rain jacket and/or wind breaker. The mountain is notorious for having very high winds, and there’s always a chance of an afternoon thunderstorm. 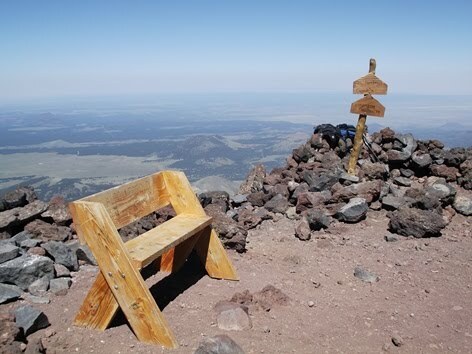 Humphreys Peak is the highest mountain in the San Francisco Peaks, all of which are extinct volcanic peaks. 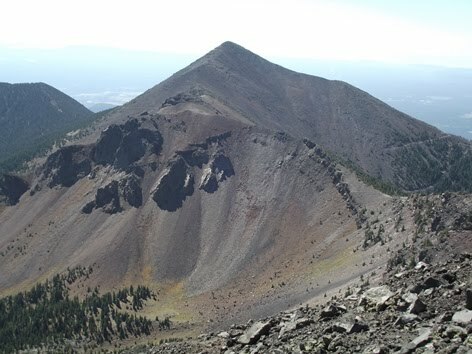 Its smaller neighbor to the south is Agassiz Peak (below), the mountain on which Arizona Snowbowl is located. Geologists say that at one time, before the volcano erupted, Agassiz and Humphreys were actually one mountain. They estimate that the peak reached a height of more than 20,000 feet. We were pretty fortunate to have only a little wind on the day of our summit. As we stood there at the top, we did have one strong gust that lasted for about 30 seconds or so. Three times within that short time period a small vortex had formed. Each one lasted only a second or two, but each made an audible whooshing noise, and were made visible by the dust they kicked-up. 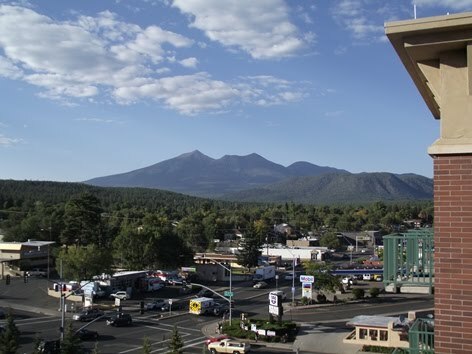 Humphreys Peak is named for General Andrew A. Humphreys, a Union general during the Civil War, who later would become the Chief of Engineers for the U.S. Army Corps of Engineers. Afterwards Kathy and I went to the 1899 Bar and Grill and chowed down on some of the best Buffalo wings we’ve ever had. They were made with tequila and achiote, a seed from a flower imported from Brazil that gave the wings a completely unique taste. They were then topped with picante sauce and served with a jalapeño cream sauce. Several of the entrees served in the restaurant were also made with achiote. Along with some great local brews, I highly recommend stopping at this local restaurant if you’re ever in town. If you wish to try the spice at home you can also order it from the Flagstaff Farmer Market. 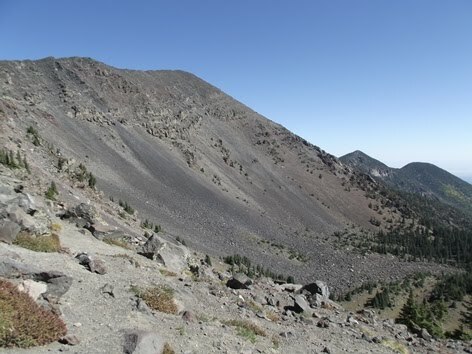 Hiking Northern Arizona features 120 of the best trails in this spectacular region. 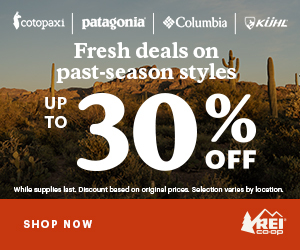 Included are high alpine trails near Flagstaff, as well as desert hikes in the stunning Red Rock area of Sedona. Also included are hikes near Williams, Camp Verde, Cottonwood and Jerome. Hiking Northern Arizona offers outings that are suited to day hikers and veteran backpackers alike. On Saturday, November 17, the public is invited to celebrate the connection of two bike-hike paths - the nine-mile Mammoth Cave RR Bike & Hike Trail to the one-mile Park City Bicycle and Walking Path. Participants should gather at 10:30 a.m. at the historic Mentz Hotel in Park City. "There will be brief remarks at 10:45, and we will cut the ribbon and release the runners and riders at 11:00," said Myrisa Christy, Mammoth Cave Resource Conservation and Development, who is organizing the event. "The Mentz Hotel will be open for viewing, staffed by the BRIMS volunteers. We really hope the community comes out to enjoy the day and support the excellent partnership between Park City, Mammoth Cave, and the Kentucky Department of Transportation." The Kentucky Department of Transportation provided the connection by including a lane for bicycles and hikers in its reconstruction of the I-65 underpass at Exit #48. BRIMS stands for the Barren River Imaginative Museum of Science. "The trail has been about ten years in the making, and we truly appreciate and applaud the Kentucky Department of Transportation for providing the connecting link," said Park City Mayor David Lyons. "Hikers and bicyclists can now travel the route of the old Mammoth Cave Railroad all the way from Bell's Tavern and the Mentz Hotel in Park City to the resting place of Engine #4 and its combine car near the Mammoth Cave visitor center." "It's like putting history back together," said Bruce Powell, Mammoth Cave NP Acting Superintendent. "Park City and Mammoth Cave share a common history related to the Mammoth Cave Railroad, which operated between the two entities from 1886 to 1931. Now a recreational trail will tell its story." The Park City Bicycle and Walking Path winds through town, past Bell's Tavern and the Mentz Hotel. In the Park, the trail follows the remaining portions of the old berm of the Mammoth Cave Railroad. There are six entry points so that hikers and bicyclists may choose to cover the entire 10-mile length, or opt for shorter segments. Wayside exhibits along the length of the trail describe daily life of the families and communities that called Mammoth Cave home prior to creation of the national park in 1941. The "dummy engine" pulled a single car loaded with freight and travelers on their way to see the famous cave; the engine and car are displayed in a field near Mammoth Cave Hotel, where the depot once stood. Within in the Park, the trail is NOT uniformly flat or level. The Park is located in hilly country, and riders/hikers must ascend and descend grades that can in places be steep and difficult. On the sections of trail between the Furlong Cemetery spur trail and Shackleford Cemetery, and between Diamond Caverns and Locust Grove Cemetery, riders MUST dismount and walk their bikes along the designated area of trail. Caution: The exact route of the Mammoth Cave Railroad could not be completely duplicated due to the development of state and Park roads since the railroad's closure. The route of the trail crosses these roads at several places and some walkers may choose to cross the CSX Railroad in Park City. Trail users are asked to use extreme caution at road crossings and the railroad crossing. America’s 398 national parks will offer everyone free admission during the Veterans Day weekend (November 10-12) in honor of those that serve and have served in the United States military. From frontier forts to World War II battlefields, more than 70 national parks have direct connections to the military. These include our earliest national parks where army engineers designed park roads and buildings and the cavalry enforced regulations from 1886 until the National Park Service was established in 1916. National parks throughout the country will hold special events to commemorate Veterans Day. 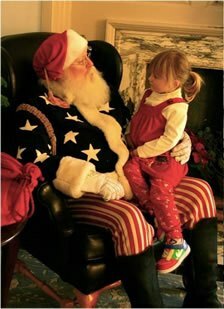 Highlights include evening candlelight tours of Vicksburg National Cemetery where visitors will encounter historical personalities, the 7th annual illumination of 6,000 graves at Poplar Grove National Cemetery in Petersburg National Battlefield, a Continental soldier encampment at Independence National Historical Park, a talk on the African American Civil War experience at Natchez National Historical Park, and an exhibit and talks about the Roosevelts in the World Wars at Sagamore Hill National Historic Site. Additional benefits for veterans on Veterans Day include a free Boston Harbor Islands National Recreation Area cruise that will pass the USS Constitution on its way to Georges Island, home of Fort Warren and, in partnership with the Gettysburg Foundation, free entrance to the Gettysburg National Military Park museum. The Veterans Day weekend is the last of the National Park Service entrance fee free days for 2012. More information is available here. In honor of Veterans Day, the Daniel Boone National Forest in central Kentucky is waiving fees at several recreation areas. The fee waivers apply to all forest visitors at designated locations. In the Red River Gorge area, no fee permit is required for campers at Koomer Ridge Campground or in the backcountry on national forest lands. At Cave Run Lake and Laurel River Lake, all boat ramps may be used free of charge. Fire management officials at Great Smoky Mountains National Park have announced plans to conduct a 200-acre prescribed burn just inside the park south of Wears Valley in Sevier County, TN. The burn will take place sometime during November 11th - 24th, depending on weather. Prescribed burn operations are expected to take 2 days. Great Smoky Wildland Fire Module, a National Park Service crew of wildland fire specialists, will be conducting the prescribed burn to reduce the build-up of flammable brush inside the Park boundary in order to reduce the risk of an uncontrolled fire. "Protecting our neighbors is a high priority", stated Shane Paxton, Wildland Fire Module Leader. "Along with the positive ecological effects of controlled burning, we are reducing dangerous fuel loading near several homes which will help tremendously if there is ever a wildfire in the area." The planned burn area is bounded by Wear Cove Gap Road, Indian Camp Branch, Little River Road, and the Park boundary. In preparation for the burn, Wildland Fire Module personnel have been clearing brush and leaf litter along the Park boundary and Indian Camp Branch, which will serve as fire control lines to keep the fire within its planned boundaries. Park fire fighters and cooperator fire engines from Wears Valley Fire Department and Townsend Fire Departments will be prepositioned to patrol the lines and suppress any fire that threatens the containment lines. This unit was also burned successfully in 2009. The burn is part of a multi-year plan to reduce fuel loadings in the Wildland Urban Interface (WUI) in Sevier County. Prescribed fire is a proven effective tool in returning forests to their pre-suppression splendor. Closures for firefighter and public safety include Wear Cove Gap Road from the Metcalf Bottoms bridge to the Park boundary at Wear Cove Gap along with Roundtop Trail. Residents should expect smoke in the area.